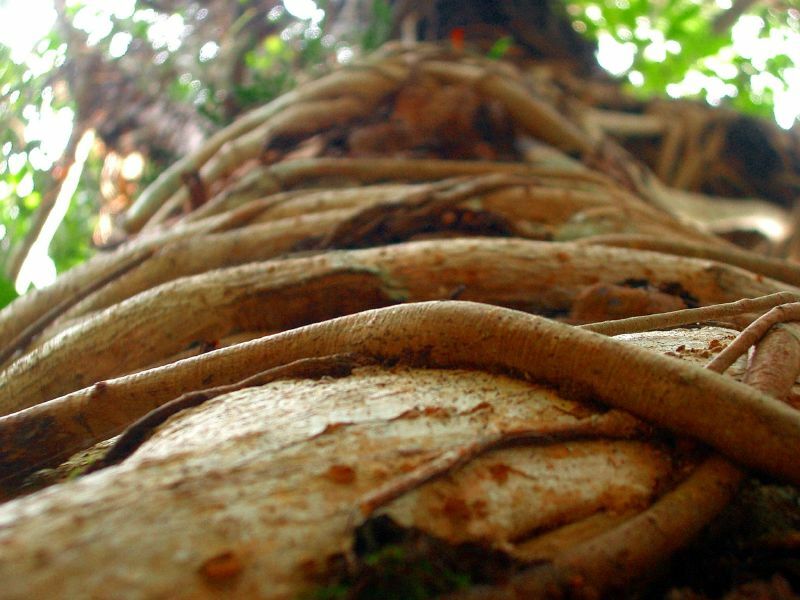 Photovine has been the source of much speculation and excitement ever since it first became known that Google was working on a project with that name. The iPhone app, which has been available in private beta for a while, opened signups to all users today, and we just had to take it for a spin. Upon first launch, you immediately notice something different: the app looks really good. In what is a bit of a departure for an app from the Google stable, a lot of attention has been paid to the cosmetic appearance of Photovine. Designed around the obvious leafy plant theme, the welcome screen offers to help you get started with the app and has options to let you sign up for an account or sign in to your existing one. Signing up for an account is a straightforward procedure and the app asks your for your full name, a username, your email address, and a password before handing you the keys. You can, optionally, also enter your phone number to make it easier for the app to find your friends for you. Once you are signed in, you can set your profile photo, add photos to existing vines or seed new ones, give the app permission to access your location (for entering in your profile), and find your friends on Facebook and Twitter (or among your address book, if you are comfortable with letting the app upload it to Google’s servers). Given the newness of the service, there aren’t a lot of users on it yet, but that should change pretty soon. To add your friends, you hit the Activity tab and then the Add Friends button on the top-right of the screen. This brings up a host of options, including searching for your friends on Facebook, Twitter, and in your address book, and sending invites through email and text message. A search bar at the top lets you search the usernames and email addresses of existing Photovine users. When you find someone worth adding, click on the Follow button to do just that. They will get a push notification (if they have it enabled, which it is by default) and can choose either to ignore you or follow you back. Henceforth, anything they do—including uploading a photo, liking one, or commenting on one—will show up under the Activity tab. When you want to refresh the list, pull the screen down when you reach the top of the page and a cute monkey appears to do your bidding. The Vines tab is where the heart of the app lies. Under three tabs, it lists all the new vines that people are showing interest in, the very popular ones, and the ones you are watching. You can scroll through these lists and the app keeps loading more vines as you approach the end of the page. Tap on any photo on any of these screens and it opens it within the vine. Each photo displays the username of the uploader, the number of times it has been watched and liked, and the number of comments it has received. You can like a photo or leave a comment of your own, tap on the username to view their profile, or simply swipe in either direction to move to the previous or next photo in the vine. A watch/unwatch button in the navigation bar lets you add or remove vines from your personal watched list (which is not shared with other users). Adding a photo to a vine is simple. If you are already within one, you can press the large green camera button at any time to bring up the camera view and snap a photo. 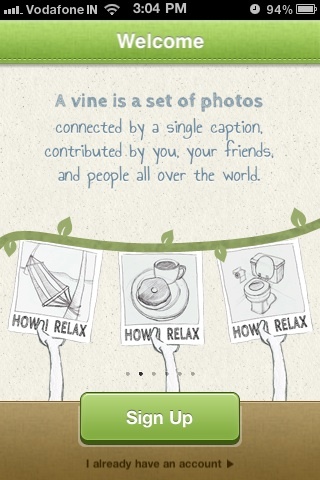 Elsewhere in the app, if you press the same button and snap a photo, you are presented with a search bar where you can type the name of a new vine. If a vine similar to the one you are creating already exists, you can add your photo to it; alternatively, you can proceed with creating a new vine and wait for others to participate in it. It also presents you with options to share your new submissions to Facebook and Twitter. The service uses small 640 x 640 pixel photographs and works well even on a spotty 3G network. Other miscellaneous features include the ability to send private messages to others on Photovine (without the need for any follower/following relationship) and reporting users who you feel are misusing the service. Photovine uses push notifications to alert you when you are mentioned on the service (though I was never able to figure out how one goes about doing that), gain followers, or receive messages, likes, or comments. You can turn these off selectively within the settings for your profile. It does not, however, alert you when new photos are added to vines that you are following, which struck me as a missing feature. There are some other areas of the app where it feels unpolished. The Inbox tab does not sport a badge when you have unread messages in it, so you have to check it manually to make sure you haven’t missed anything. I also sometimes find myself logged out of the app, for no apparent reason, when I launch it. The password-recovery process isn’t in place yet, with the option taking you to a basic webpage requesting you to send an email to the support email address to have your password reset. The web app also feels fairly incomplete right now, with the very little maneuverability between various photos making it practically impossible to get to a photo you saw in the iPhone app. I expect to see these problems addressed over time. These teething troubles aside, however, Photovine is a great application that does what it promises to with aplomb. 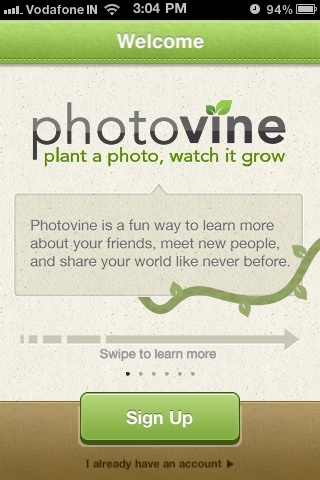 Even as someone who has never understood the craze behind its predecessor Instagram, I really like the concept of Photovine. The titles of vines, coupled with the few teasing thumbnails below them, practically scream at you to tap on them, and before you know it, you’ve seen thirty photos of people showing off their pets and are rushing to snap a photo of your own. It really does grow on you.